Berkhamsted Sports is (one of) the town’s oldest independent retailers, having been an institution on the High Street since 1976. The shop remains as popular today as it did when it first opened more than 40 years ago, something that owners Nick Dufficy and Dave Walden attribute to the friendly, knowledgeable and personal service they provide to their customers. Along with stocking the best selection of sports apparel and accessories in the area, at competitive prices. Today, Berkhamsted Sports specialises in running, tennis and fitness, and carries a fantastic range of brands and products, all hand-picked by Nick and Dave to cater for every level of ability, whether you’re a complete beginner or a seasoned veteran in your chosen sport. As well as offering an unrivaled array of sports gear, you can also head to Berkhamsted Sports for a whole host of other services and advice. Runners can book a free in-store gait analysis. They can also receive personalised recommendations for their optimum footwear tailored to their individual running pattern. The shop also works closely with several local physiotherapists and podiatrists and can make introductions for customers seeking professional advice on sports injuries and rehabilitation. Nick and Dave are also experienced LTA qualified tennis coaches. They offer a wealth of tennis services and products for any fledgling Federers and would-be Williamses, including on-site racket re-stringing to your own specifications, and recommendations to a network of local coaches. If you’re in the market for a new racket, they can give you impartial, friendly advice on the best model to go for to help raise your game to a whole new level. 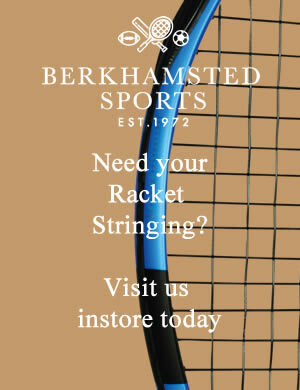 With over 100 varieties of racket in-store, Berkhamsted Sports really does have all your tennis needs covered from baseline to net! Thanks so much for taking time to visit our site today. We really hope you find what you’re looking for here. Nick, Dave and their team also look forward to welcoming you to Berkhamsted Sports in person too! Today, hundreds of customers have purchased products from us, why? We love our customers to visit us in store, why? Because their is nothing like personal service! We may be small but we offer some of the best in class sports products you can find at prices that will surprise you. From the latest tennis raquets through to clothing, trainers and so much more.